Book Blogger Appreciation Week is coming in September. As part of BBAW you can vote on your favorite blogs for cool awards! But nominations close on August 15, so be sure to head over to the BBAW site to register yourself and nominate your favorite blogs. BBAW was created by Amy at My Friend Amy and she's started a BBAW meme with some questions about blogging. Since this will be my first BBAW, I'm answering the newbie questions. -Going to ALA and having other bloggers and authors actually know who I am! That is still so surreal to me. I still can't believe people read my blog. Also connecting with other book lovers who understand my need to browse for hours in bookstores and love for libraries and don't think it's weird when I say I love the smell of books or the feel of books pages. Making friends with people who share my interests has been a great part of blogging! 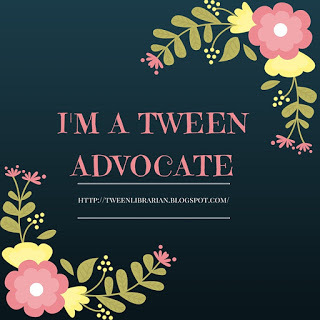 -I was inspired to start my blog thanks to Little Willow. Her reviews and booklists were super helpful when I first started working in a library and I wanted to keep track of what I read the same way. Also, Presenting Lenore and Shooting Stars Mag were some of my first followers/commenters and they kept me motivated to keep blogging because I knew someone was reading. Melissas-Bookshelf has great posts on layouts that have been super helpful! -What is the best way to get involved with BBAW (other than nominating blogs) and how can I connect with other bloggers? Post your BBAW meme and don't forget to link back on the BBAW site. I'm so glad you're joining in BBAW this year! I bet it was REALLY awesome to have people recognize you by your blog!!! And I love Lenore, too! As far as getting involved, the week of BBAW there will be topics each you can blog on, pretty soon, I'll be posting the chance to swap interviews with another blogger, you can host a giveaway, and also I hope you just enjoy the event!!!! Like you, I'm new to blogging and this will be my first BBAW to participate in. Also like you, I like the community that blogging brings with it. Everyone I've encountered (bloggers/publishing company people, etc) have been tremendously welcoming and helpful. It's been a wonderful experience. I'm still sad that I didn't see you at ALA. I would have been another person that recognized you! It's my first BBAW too. We can be newbie buddies. This will be my first BBAW as well. It sounds like so much fun! I hope you enjoy it! Ha ha - I love the smell of books too! I so want to go to ALA next year, need to find info on that. Love the experience that everyone is sharing and I so want to be a part of that! This is also my first BBAW, and I can't wait to meet other bloggers! The community is amazing, and I totally agree with your answers to #1.